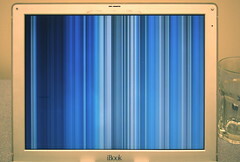 My iBook is 4 1/2 years old, and every time I turn it on I fear something like this. I'm really hoping it will survive until Jason has graduated, but I think 6+ years might be pushing it. Still, crossing my fingers. Nice that it looks pretty even while dying...although obviously not as pretty as a new one!